As promised in this post (More Love from South Dakota), we embellished some of the hats Cindy & Brittni created with the yarn they sent. 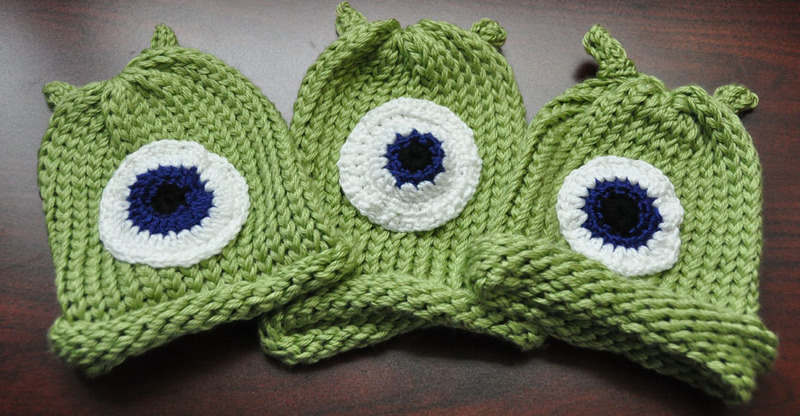 Here are 3 Mike Waszowski’s from the Monsters, Inc movie. Later this month, Monsters will be having a prequel released, and I am sure Mike is going to be a popular character this summer. I have another idea for embellishing some of Cindy & Brittni’s hats and will try to put that into work soon. 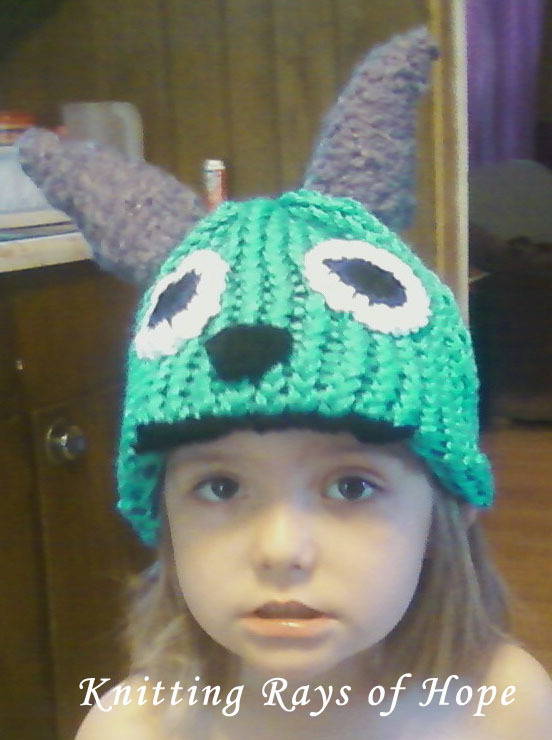 For a free pattern on how to loom knit the Mike Hat and then crochet the embellishments, please go to this post (link). PS- This is our 200th post! WooHoo! 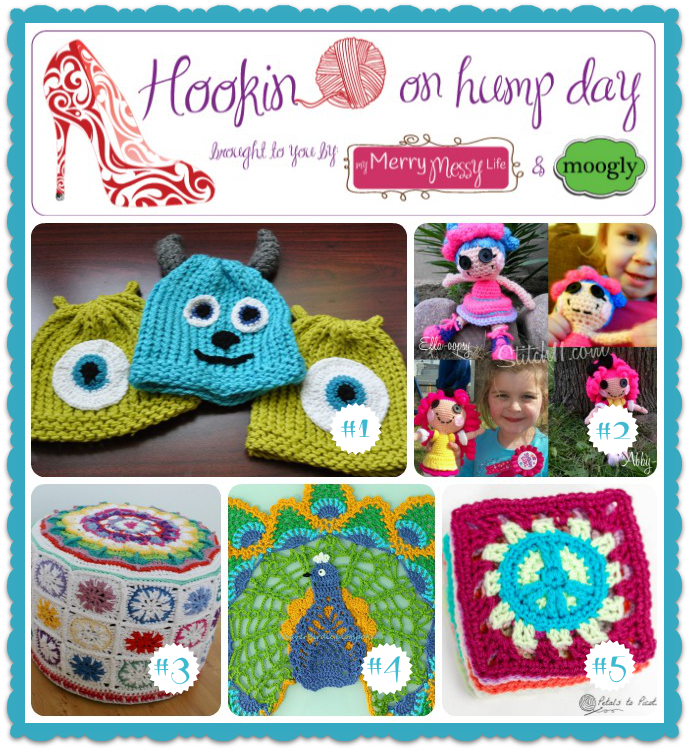 Last week we joined the Moogly & My Messy Life link up party with our Mike & Sully hats (link) and are very excited that we received 1st place! Woot! We are told by one of the hosts that our hats received double the clicks in the Link Up Party. We are grateful for all of your support and interest to those who clicked on the link. JJ was born 15 weeks early and is truly a itty bitty fighter. He is still in the NICU and has had surgery and some complications. We keep JJ and his family in our prayers for strength. Hopefully, when he is doing a bit better we will have a picture to share. 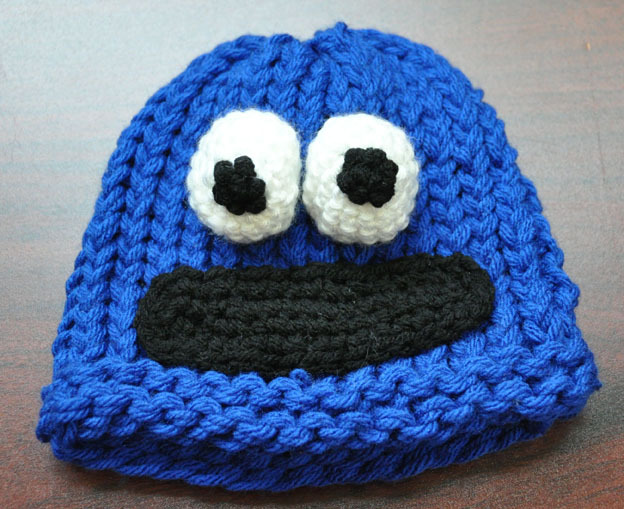 I made this Cookie Monster hat on a newborn round loom using the garter stitch for the brim and then a typical e-wrap stitch for the hat. 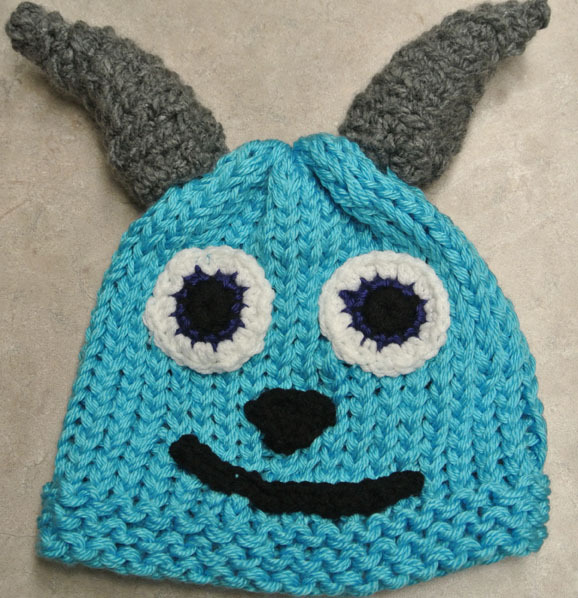 The eyes and mouth were crocheted and then sewn onto the hat. 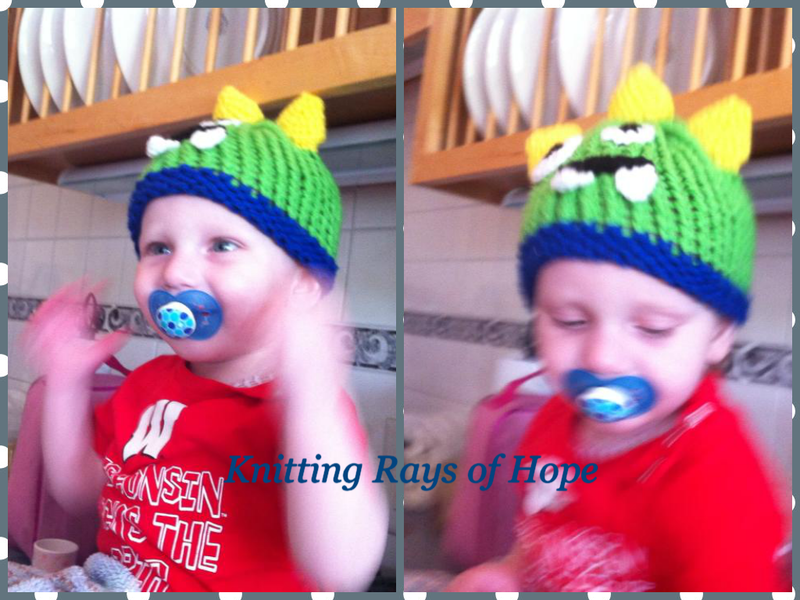 If you would like to support JJ or follow his journey, stop by his Facebook Page (link) and let them know you are part of the Knitting Rays of Hope community. He began experiencing issues shortly after birth. Unable to keep down feedings and loosing weight at 2 weeks old Mighty Kellan was admitted to the hospital for testing and the placement of an NJ tube (feeding tube from nose to the intestines). We made slow progress with weight gain after several admissions to the hospital and the continued bulking up on calories but we still had no answers. A second opinioin lead us to the decision of a g tube (feeding tube button place into his stomach) at 4 months of age. Again progress was slow and soon Kellan’s development began to lag behind. He was started with PT, OT, ST around 7 months of age. He still to this days struggles with developmental delays but has recently started walking. Around his first birthday Kellan underwent surgery for a benign palatal tumor. Some results from genetic testing lead us to see a second opinion endocrinologist who started Kellan on growth hormone at 15 months of age, Kellan was at this time diagnosed with growth hormone deficency. In late April of 2012 Kellan experienced his first seizure and was placed on antiseizure medication. Then in June 2012 suffering from what we thought was a stomach virus Kellan was admitted to the hospital where he would spend the entire summer and fall. After many failed attempts at restarting feeds through various types of feeding tubes (g tube, gj tube, nj tube, j tube) it was determined that Kellan would remain on TPN (IV nutrition) for the forseeable future. With the start of IV nutrition we saw Kellan put on weight, grow and make progress developmentally, all things that were huge issues prior to TPN. We still have a long way to go and no answers but our Mighty Kellan keeps battling and smiling every day. We appreciate your prayers, thoughts, kind words, questions, and thoughts. Kellan truly is a Mighty boy. He has been fighting since birth and still manages to maintain a beautiful smile. I can see it shining through his pacifier. Please stop by his facebook page (link) to show him some love and support. Be sure to mention that Knitting Rays of Hope sent you. Kellan, we hope that you keep up the fighting and pray that you are healed of all problems and live a full and healthy life. 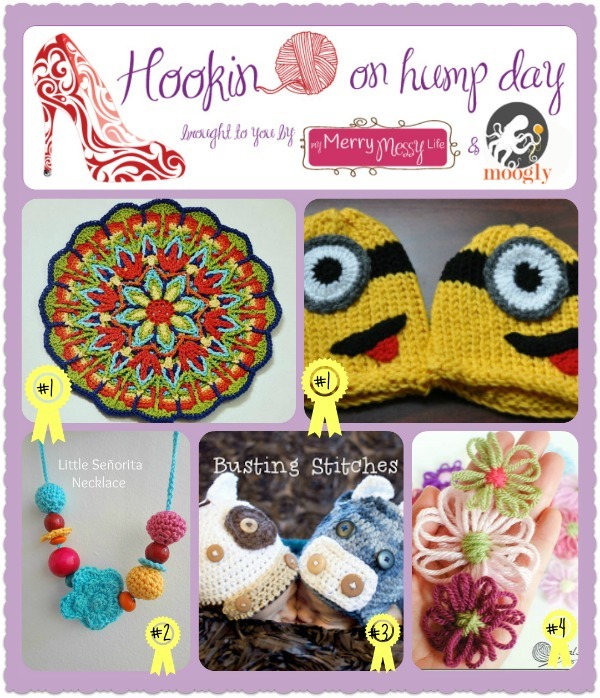 Last week we joined a link up party with our Minion hats (link) with Moogly & My Messy Life and are very excited that we tied for 1st place! Woot! We participate in the link up party for community and enjoy seeing the creations of others. The link up party increases our traffic to the blog and gets our name out there. The more we spread awareness, we hope the more people will want to help with our cause. We started the link up party with Izzy’s Lightening McQueen hat and saw the WordPress map of clicks by countries light up. We were so impressed that people from all over the world were interested enough to click on our blog. We are excited and humbled.